HotBot was launched in 1996 by Wired Magazine. 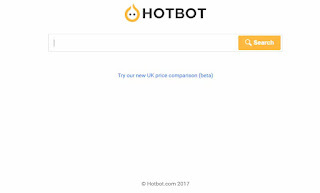 In the course of the next 20 years all major search engines played with HotBot in one way or another. In the beginning Inktomi was used as search technology. A short time later Direct Hit and the Open Directory were added and HotBot worked as a meta search engine. In 2002, Lycos purchased HotBot and switched to a multisearch interface. 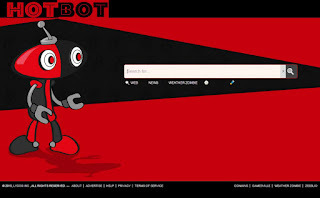 The user could choose between different search engines, such as Google, Lycos, Ask Jeeves or HotBot (Inktomi was renamed HotBot), followed by Yahoo, LyGo, MSN and others. 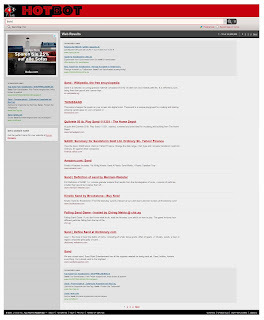 In 2011 HotBot switched to a search portal and offered a news search among others. As search technology Lycos was used, which got its content from Yahoo, which in turn used Bing. Since Sommer 2017 the side offers no own resultpage anymore it’s only a search interface directing to Bing. 1996 - 1998 Wired Digital, Inc.
»HotBot used to be a really cool search engine started by Wired Magazine. Like us, it was launched in 1996. It was free, easy to get listed, and provided a quick, down-and-dirty search. Plus, it was one of the first search engines to allow web masters to put a copy of the engine on their sites. In 1998, Lycos purchased HotBot. By 2002 it was another meta search engine crammed with paid advertising. Now, HotBot search results are provided by Lycos, and Lycos search results are provided by Yahoo!, and of course, Yahoo! search results are provided by Bing. So, HotBot search results are hybridized (by Lycos) Bing search results which are provided to Lycos through the Yahoo! Search API. Owen Thomas (February 22, 1999): »On Monday, Wired Digital's HotBot search engine began serving results directly from Direct Hit. Wired and Direct Hit estimate that between half and two-thirds of HotBot users will be served a page with results from Direct Hit's "popularity engine," a database that ranks pages by the number of users who actually follow links to them. Previously, Direct Hit results were offered to HotBot users as an option to supplement a Web-page database provided by Inktomi (INKT). "In the short term, it means that we send fewer queries to Inktomi," says HotBot marketing director David Pritchard. "But with the rapid growth we've seen in HotBot, we expect that should more than make up for it -- the pie gets bigger." DIVERSITY IS KEY Inktomi doubts that the San Mateo-based company's results will suffer in the next quarter. According to spokesperson Kevin Brown, Inktomi gets less than 20 percent of its revenues from HotBot, and search services now represent less than half of all revenues. The company has diversified its search customer base to include giants like Yahoo (YHOO), and is seeing strong growth in its Traffic Server caching product. It also will soon launch customer sites using its Shopping Engine, including Infoseek's Go Shop. The HotBot account is still a flagship for Inktomi; when the search engine launched in 1996, HotBot was Inktomi's only customer, and revenues from the HotBot partnership helped sustain Inktomi through its initial public offering and beyond. Since 2017 the search engine offers no own result page anymore and goes to Bings result page.